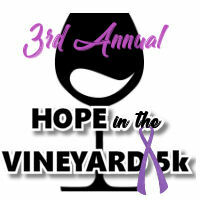 Hope in the Vineyard 5k is a timed run/walk through the beautiful Hedges Family Estate vineyards and other surrounding Red Mountain wineries. 100% of our proceeds will be donated to the American Cancer Society Relay For Life. Parking is available at Hedges Family Estate BEHIND the tasting room. Signs will be posted and volunteers will help guide you. Carpooling is recommended to help with parking space! A glass of wine is included in your adult registration. Be sure and put on the red bracelet that will be in your race packet if you plan on enjoying a glass of wine from Hedges Family Estate after the race. Packet pickup will be at the Tri-City Court Club (1350 N. Grant St, Kennewick) on Friday, June 14th from 3pm to 6pm. You will also be able to pick up your packet on race day at 8am. The timed race (manual timing) will be on pavement as well as gravel and does include hills. No dogs please. Strollers are ok, but be aware that you'll be pushing a stroller on gravel! Performance/soft/polyblend t-shirts and tanks (mens fit and ladies fit) are included in all adult race entries, registered before June 1st. (womens sizes are more fitted, so please size up if you want a roomier fit!) You will automatically be given a mens or womens t-shirt or tank based on your registration as a male or female. If you would like something different than that, please let me know! A team needs to consist of 4 or more registered runners. The first 4 team members need to sign up together. If you have more team members to add later on, they can register individually, but please contact the race director for your team promo code in order to keep getting the team discount! I know that running a road race is potentially hazardous activity, which could cause injury or death. I will not enter and participate unless I am medically able and properly trained, and by my signature, I certify that I am medically able to perform this event, and am in good health, and I am properly trained. I agree to abide by any decision of a race official relative to any aspect of my participation in this event, including the right of any official to deny or suspend my participation for any reason whatsoever. I attest that I have read the rules of the race and agree to abide by them. I assume all risks associated with running in this event, including but not limited to: falls, contact with other participants, the effects of the weather, including high heat and/or humidity, traffic and the conditions of the road, conditions of the trails through the vineyards and all such risks being known and appreciated by me. I understand that bicycles, skateboards, roller skates or roller blades, and animals are not allowed in the race and I will abide by all race rules. Having read this waiver and knowing these facts and in consideration of your accepting my entry, I, for myself and anyone entitled to act on my behalf, waive and release the Hope in the Vineyard 5k, the city of Benton City, Hedges Family Estate, the American Cancer Society Relay For Life, all event sponsors, their representatives and successors from all claims or liabilities of any kind arising out of my participation in this event, even though that liability may arise out of negligence or carelessness on the part of the persons named in this waiver. I grant permission to all of the foregoing to use my photographs, motion pictures, recordings or any other record of this event for any legitimate purpose.